Plans are good. Plans are usually necessary for me to stay on task. But how do you know when the plan is good thing and when it’s just another to-do list adding to my already cluttered agenda? It’s hard for me to know. After a few hours of plotting and planning and deciding it’s physically and emotionally impossible to participate in more than TWO 30 day challenges at a time I’ve decided to just list my priorities and hope that this exercise will clear the path for me to make better choices this year. Because really that’s all I want. I want to wake up each day and know that I’m moving forward… Trying to be just a little better? A little more loving, more compassionate, more effective, more influential, … Leaving the world and people around me a little better than it was before. 1. Spend more time with my wonderful husband. 2. Take time to purposefully nurture each of my children. 5. Spend time encouraging the people who are in my life. That’s IT! Maybe I don’t need a fancy 30 Day Revolutionary plan after all! Here’s to living life on purpose in 2014! Sound like a great plan! Love the way you’ve illustrated your goals. 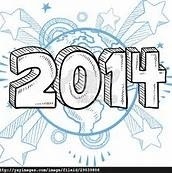 Have a good 2014! Thanks! I’m counting on the fact that I’m a visual learner! Happy 2014!